Disclaimer - I am so far from a scientist that my high school science teacher probably rolls around uncomfortably in his grave every time I even use the *word* scientist. This is an interesting hobby, but no testing is done except with my senses. Originally my thought was to wait until fall when the leaves would be more substantial, but I just couldn't wait. Now it will be fun to do it again at that time and compare the results. As it turns out, in the spring it is almost as time-consuming to pick a basketful of leaves as it is to pick a basket full of blossoms. The young leaves are still below the flowers, making the picking a little complicated. It took a few hours to do, but it was such a gorgeous day that the time flew. The best leaves were in the woods, along the path. Getting set up, I packed the still with the leaves. There is a full market basket of leaves crammed into that globe. Usually it doesn't really get stuffed, but I wanted as much material in there as possible. It was so tightly packed that after the water below started to boil, I started to ponder what would happen if the steam was unable to penetrate the leaves and gave the boiling flask a wide berth until it was clear that it could. The first few tablespoons of hydrosol to be produced had an almost melon-y scent. Very interesting and complex. 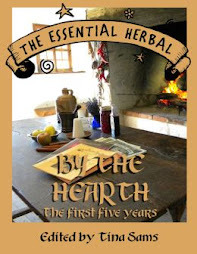 However, over the course of the next 45 minutes, the green bean scent that is typical of leaves with little or no essential oil became more pronounced. Plantain, jewelweed, comfrey, chickweed - all produce a green bean type aroma. In many cases, the hydrosol still has the property we're looking for, especially jewelweed and comfrey. So the basketful of leaves eventually steams down to about 3 cups worth of green goo. In less than an hour, the steam finds a direct channel through the goo and bubbles up through that one spot consistently. It occurs to me that the distillation is finished, because it is pretty much just steam anymore - not passing through the material, but making a straight shot through it instead. If you look just below the clamp and compare it to the picture above, you'll see the mesh plug protruding downward. The heat is turned off and we have a couple of cups of the clear hydrosol. The bean scent is prominent, but there is more... a very light floral, and something that makes me want to keep sniffing it from time to time. If the bean fades, it might turn out to be pretty nice (but not holding my breath). It was late, so I left the still to cool and went to bed. This morning the goo had really settled in and was starting to ooze out of the bottom of the flask. There's a mesh plug that is not a tight fit - but it never got pushed out before. Fortunately the goo was pretty intertwined in the mesh... Not my favorite before-breakfast activity, but it all worked out. I'm very curious to see what happens in a few months with leaves that are not so tender, and also to see if the background fragrance will develop. When my daughter was little, she was always my companion and helper during violet season. For a week or two each spring, on sunny afternoons we'd go down to the orchard with baskets and sit under the blossoming trees picking violets for drying, syrups and jelly. During those hours, she and I would discuss all the burning questions of the day. Why aren't there violets all year long? Why does the dog always chase the rabbits and groundhogs? Do bird mamas love their babies? And so the days would pass. Quickly. Ever so quickly. Eventually Aunt Susie taught her to see 4-leaf clovers, and that took her focus for a little while, but she was still around, talking and singing and chewing on a piece of onion grass. We'd string rosebud necklaces as soon as that time came, and we'd walk along the creek and make discoveries as soon as it got warm (we usually waited until it was warm because bodies of water seem to have a magnetic pull on her - have water, will fall in). I can sometimes convince people to do some of those things with me, but she was always game for everything. I used to tell her that she wasn't allowed to grow up and my mother would gasp and say, "Don't EVER say that!" Mom had 5 of us and perhaps missed my point, having been pretty happy to have us grow up and get on with our lives. It wasn't that she didn't adore the "little us's", it was just exhausting, I suppose. I never knew that each stage of life - infancy, early childhood, kid-ness, young adulthood, and onward would all be like different people that I would come to miss. That little kid is now a young lady who is a joy to be around, but I miss all of the others as if they were separate individuals. Especially during violet season. So now I sit in the yard and pick by myself. She's off earning a living. It doesn't make me sad so much as it gives me time to reflect on how perfect those days were and wonder if I appreciated them as fully as I should have. It truly is the everyday occurrences that we most treasure later on. Mamas - stop a minute and take a mental picture of this day. Write it down, savor it and know that the day will come that you will miss the little person who is in the process of growing up. That's all. Because of what I do for a living, more than half of my close friends are business owners. Most likely they have no employees and pour their hearts and souls into their businesses. We call our various businesses our "babies," and are often raising our kids at the same time, again often without help. So when a friend wrote to me the other day hurt and angry that she was being slandered on a large plant/herb forum by (oddly enough) a brand new woman in business, my heart really went out to her. My friend is a wholesale supplier. She accepts orders and then produces to fill those orders. When those orders are cancelled, she scrambles to find another way to sell the items. The complaint was about the cost of shipping. She doesn't make a cent on it, and every year she agonizes over how to shave some of that cost off for the customer. I'm not talking about her spending 15 minutes looking at websites. She researches the various shipping companies, box measurements, the weight of boxes and every other minutiae one could possibly think of - while still ensuring that the product arrives in good shape. Other than that, shipping is completely out of her control. I won't name her business (nor that of the newbie complainer - Karma will take care of that), but can tell you that the order was not charged for several months while it was in production. The shipping charge was clearly stated, yet ignored for all that time. When the order was cancelled, a small restocking charge was levied (also clearly stated), causing newbie complainer to howl like a banshee. So the thing is, in all the years I've been in business (more than 20), there have been very few times when I've noticed people owning businesses who don't make huge sacrifices for their customers - even if the customer doesn't know it. 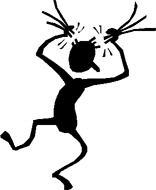 Occasionally there are greedy business owners, but they go for a lot more than a few dollars in excess shipping. Maybe she thought she could get my friend to pay her shipping, thinking she had her over a barrel. Maybe she ran out of funds, changed her mind, or found a local supplier. Either way, that wasn't the fault of the business she's complaining about any more than the cost of shipping is. Get to know your suppliers. Ask other people for recommendations If you feel like they're taking you for a ride, find someone else. If you have a complaint, take it to them - not a public forum. And if it is something that they have no control over, get a grip. Being inside today means being in some way connected to the news of the manhunt in Boston. Even several states away, it is surreal and it saturates everything with fear and the feeling that bad people are everywhere. Enough! Into the woods! I happily snapped as I went along, but the pictures are in no particular order. They are all taken between my backyard and the far edge of the property. Come on. It'll make you feel better. It sure did help me! A tiny barberry plant growing right next to a dead nettle. Blackberry canes have arched across some parts of the path. They are very prickly. Missed the blooms of the Bloodroot, but the seedpods are ripening. In a few square inches, we have the leaves of Bloodroot, Jewelweed, and Trout Lily. The creeksides are waking up and really getting gussied up. Overnight (seriously!) the dandelions have burst into bloom. Dutchman's Breeches. We introduced these, and love to watch them spread. False Solomon's Seal are one of the most prevalent plants on the forest floor. Standing in the forsythia by the pond turned the world bright yellow for a few minutes. I've not identified the ferns in the woods, but this frilly little lovely caught my eye. Garlic Mustard is already in bloom. If we could convince people to eat this as much as we eat lettuce, we'd never run out of it. Very invasive, it is very aggressively moving across the floor of the woods. These actually have a sweet pink blush, but my camera isn't picking up some colors lately. I'll have to look these up. The Spring Beauties that carpet the other hillside across the creek have petals that are more oval shaped and separate. Although this doesn't look impressive, it made me let out a little "whoop" when I saw it. Ramps are another introduced species here, and this singleton showed up nearly 10 feet from the nearest spreading clump. Awesome! Mayapple preparing to unfold. The center bud will become a flower and the "shoulders" are 2 individual leaves. This is the pathway between our homes - my sister and I. It is lined with fruit trees and bayberry bushes. The lush, gorgeous, full spreading clumps of ramps. Also introduced, the blood-red trillium has made herself at home and is spreading very slowly. One of the 2 introduced wild gingers, this one shiny leaved, the other fuzzy leaves and stems. Both are doing well and stretching out, covering ground. Introduced white trillium is even slower to reproduce than the reds. Still, it does seem to be forming clumps rather than single stems in close proximity like the others. Spicebushes are everywhere throughout the woods and are in full bloom right now. They are what spring looks like in my mind's eye. That color, caught in the sunlight is the essence of spring. Just in the past few years the trout lilies have found their way to the near side of the creek. This is a nice clump right off the main path. I appreciate their cooperation in helping me avoid falling in the water. Maybe they can have a word with the red Trillium, the Dutchman's Breeches, and all the Spring Beauties. We have also introduced Solomon's Seal (although we've recently found huge plants near one of the bamboo patches). It started with one stem, and I counted 6 this morning. The uppermost of these plants is a false Solomon's Seal. All along the path, violets carpet my footsteps. A nice clump of white Trillium. It makes me so happy to see them getting comfortable here. Yellow is a nearly impossible color to pick up for some reason. It washes out for me, but there are tons of bright yellow violets all along the woodland floor, along with various shades of blue and purple violets. Greater Celandine is just starting to bloom, and I was thrilled to see that 2 out of 3 of the Pawpaws we planted last year were not eaten, and have leaves. Didn't see a single Jack in the Pulpit up yet, which seems odd, especially that they have been plentiful in years past. I still think we need to put some VA bluebells in there, and we've got some native foxgloves ready to go in along the edges of the woods. I have no doubt that an herb festival or visit to a garden center will bring other natives into reach, and we'll add them. A third attempt at wintergreen is not excessive in my opinion, especially because we'd really like to have it handy. There. Doesn't it feel like you can breathe a little more deeply now? All last week we were hustling around getting the writer/advertiser/wholesale copies of the magazine packed to ship, mini-magazines off to conferences and shops, An Elder Gathering picked up from the printer in time for the herb festival on Friday and Saturday that we were also busy packing for, and trying to straighten up the digs for a visit starting Sunday from a very sweet house-guest. It was a little bonkers around here, and the whole time there was that tick-tocking of the earth waking up. We passed drifts of dutchman's breeches on the way to the festival, and splashes of spring green on the tips of trees. Spring bulbs blazed from every front yard and baby farm animals pranced and kicked up their heels everywhere we went. I was dying to get outside so in spite of the light rain today, I had to at least check the yard. Everything has changed in a week and a half. The field to the one side of the house has very few trees and the ground is scattered with jewels. Dead nettle, dandelions, speedwell, violets, shepherd's purse, and mustards are just some of the blooms adding to the colors on the ground. The black raspberries that we transplanted a few weeks ago are sending out leaves. Yellow mustard will soon turn vast swatches of fields a brilliant yellow. Often these patches are beside large patches of red dead nettle, turning the countryside into a patchwork quilt of beautiful colors. All of the blueberry bushes are happy. Several of them are blooming while a few others won't bloom for a few more weeks. There is something so beautiful about these plants. They mesmerize me. The currants are already in bloom too. The fruit trees (cherry, persimmon, elderberry) are still concentrating on leaves, but the bush berries are going like gangbusters. These dandelion buds are amazing in that they are a bit bigger than a penny. Looking around, they are all like that! Must be something about the weather, or perhaps the difference between last spring and this one. Whatever, they're huge. Gooseberries with leaves full of rainwater. They surprise me every year with the pure vibrancy they bring to the garden. These simple unassuming maple flowers are such a bright spot in the yard! You can barely see a leaf preparing to unfurl. There is about a 2 week period each spring when the morning light is filtered through tender leaves that are such a perfect spring green. It makes the kitchen feel magical, as if the air itself were full of springtime. I love this tree. One of the mustards. Black, perhaps? It is very sturdy and the leaves quite pungent in a salad. Shepherd's purse has suddenly appeared everywhere. The path between my gardens and the fields are full of it. Lots of work to do, but in the meantime, this is beautiful too. Pausing to look down over the back field, the white splashes are fruit trees lining the path down to the soap workshop. Seriously, if I ever complain about my life, smack me. This little tulip is very special. Molly brought me a box of bulbs back from her trip to Amsterdam to participate in the Model United Nations with several of her schoolmates. It's been 4 years, and this is the first bloom. Her achievement in being on that team made me so proud, and the tulips will always glow and remind me each spring. Violets have been steadily marching across the yard, and I've been happily allowing it. There is very little grass in our yard. When the violet flowers are finished, I intend to distill the leaves and see what we get. We all know that violet FLOWER essential oil is found only in amulets worn by unicorns during the full moon, but violet LEAF essential oil is beautiful and I suspect that the hydrosol would be great for aging skin. We'll see. It seems like it would be best when the plant is finished concentrating on blooms to harvest leaves for this purpose. There were many, many other lovely things that caught my eye. Even the buzzards playing in the updrafts looks joyful! Tomorrow it should be dry enough to go into the woods and see what is happening there, and soon we'll take a trip to Shenk's Ferry to visit the unbelievable drifts of spring wildflowers. 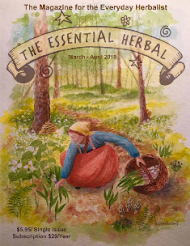 The May/June issue of The Essential Herbal Magazine went into the mail last week, and should be hitting subscriber mailboxes shortly. On the 20th, our ezine subscribers will receive a link to this issue too. 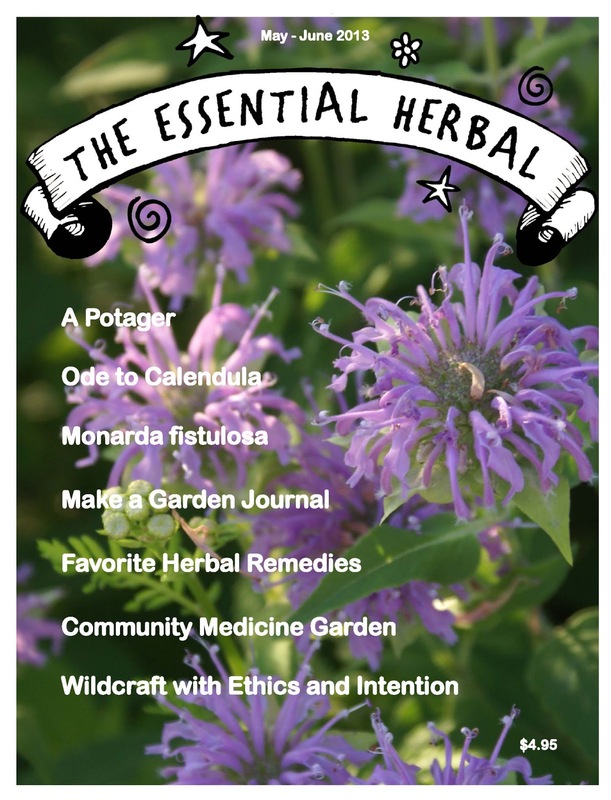 If you're not getting this magazine and you're interested in herbs, you just might be missing out on exactly what you've been looking for! Over the last 12 years, our grassroots effort has consistently provided information in a down to earth way that our readers tell us they love. In fact, most of our content comes from our readers! Only $24 for 6 issues a year, either print or on-line. Here's what we have for you in the new issue! Exciting news going on here in the office! 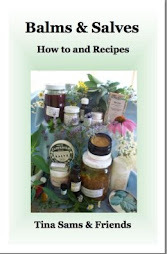 Quick overview on how to make the most often discussed herbal preparations. Marnie wanted the perfect journal, so she made it herself! The details of wildcrafting that leaves no damage. Ear oil, and lots of storage, harvesting, and uses of this wondrous weed. Gather your neighbors and begin this great project that could eventually include plants for all sorts of purposes, including food. Start with Medicine. A very popular breakfast food in our area, easy to make, delicious, and very nourishing. The "Notable Native" for 2013 is Monarda, and Jackie shares some great knowledge. Great information on all aspects of calendula, and then as if that weren't enough, Marci walks us through castile soap using calendula. The Pacific Northwest is giving Provence a run for their money, with hills covered with lavender. Start a Potager, and always be ready to prepare a delicious soup (or potager). We often talk about how many medicines are derived from herbs, and Joe talks about a great many of them. 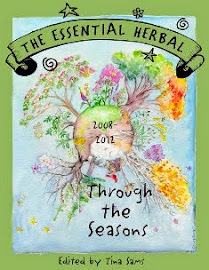 Herbs grow when many other things won't if the weather is uncooperative. They are such beautiful, delicious, delightful plants! You want to eat the weeds, but the recipes out there are almost too complex. Start simple with some of these ideas, and gradually become familiar with them. It has been about 7 years since I started on this, running concurrently with the project in the woods introducing natives. It began as a whim, to try to have some kind of fruit available from spring thru fall, and bring in other edibles that could live with the always present edible weeds. Just for fun and free food. The house is on about perhaps a half acre, nestled into the one side of the tree farm. Down at my sister's a few hundred yards away, there are apples, peaches, grapes, and Bing cherries planted along with some hazelnuts. Black walnuts are prevalent in the woods. Let me show you how things are looking so far. In addition to the plants shown, we have a corner full of sunchokes, more hazelnut trees, horseradish, and a nice new clump of nettles. There's a big mulberry on the other side of the field, and mints everywhere. A few weeks ago we pulled these black raspberries out from the side of the house and transplanted them along the garden where we grow the holy basil and some vegetables each year. We'll see what happens there. On the right is a vitex, and on the left behind the yucca (delicious edible blossoms) are two of the three elders. New this year, a black currant. It seems to be taking well. Probably fruit next year. The blueberry patch is finally growing well inside its own little fence. The rabbits and groundhogs kept nibbling off the branches each spring, so now they have great root systems. They went in the first year and this will be the first year with a decent sized crop. I hope. We had to move the fig tree because it was too close to the house and getting too big. The trunk is now 4" in diameter. The sun was too bright when I took these pictures, but you can barely make out the leaf tip poking out. Sour cherry tree. Last year a last minute cold snap destroyed any hope of cherries, I tell myself the birds would have gotten them anyhow. That makes me feel a little better. In a circle out back and also along the one side of the house, the wild orange daylilies have been transplanted because we love to eat the buds as a vegetable. Never seem to have enough, even though my sister has an entire hillside. On the extreme left, you can see branches from the elderberry bushes, and straight ahead is the sour cherry tree. The blueberry patch is off to the left between them - just to give you an idea of how it is laid out on that side of the yard. On the other side of the fence, there is a purple gooseberry bush. There's another variety that is only a fraction of that size a little further up, but it isn't visible. Outside the fence behind the blueberries, a red currant is pretty happy. There's a serviceberry tree out there too, hiding behind the currant. We already get a few serviceberries, even at that size. Two of 3 Nanking bush cherries that went in a month or so ago. They'll form a hedge straight out from the basement door. As you may have noticed, there's lots of weeding to be done. 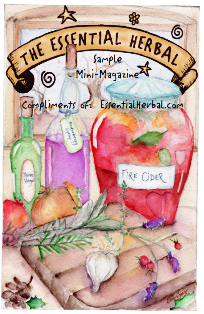 Our weather just turned a few days ago, so we'll get to that as soon as the PA Herb Festival is over and we get all the magazines out to everyone who has them coming. It's been a very busy spring, so maybe I should be thankful that the weather gave me a little more time to work inside without feeling guilty. In between all the fruit plants, there are medicinal and culinary herbs that are also beginning to wake up. The rosemary is heading into a fourth year and I noticed a few fennel volunteers. The lavenders are starting to show signs of life, and the chives should be blooming in the next couple of weeks along with the valerian. Out front, I'm watching the bleeding hearts emerge. And next week, it will be time for another walk in the woods to see what wonders await there. The pawpaws we put in down there last fall (knowing we probably won't live to see fruit) look like they made it, and I'm looking forward to seeing leaves on them.